1/ The Raspberry Pi X830 3.5" SATA HDD Expansion Board and the Raspberry pi 3 board are both not included. 2/ Please move the Jumber cap from the 12V/EN to 5v1/EN when you use the power swtich to control the power of raspberry pi and X820 (X800) storage board. if not, the switch will not work and keep power on. 3/ The max.height of the 2.5" SATA HDD used with this metal case should be less than 29 mm /1.14 inch. This is metal case with super mute cooling fan kit , it is very easy to install and a perfect choice for X830 HDD storage board user. 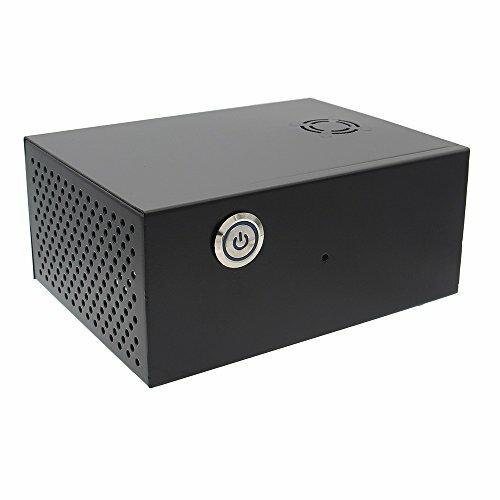 Support super mute cooling fan, Access to the PI consumer ports: HDMI, A/V Connector, Ethernet, 2-USB. Note: Please move the Jumber cap from the 12V/EN to 5v1/EN when you use the power swtich to control the power of raspberry pi and X820 (X800) storage board. For the installation guide, please refer to: www.raspberrypiwiki.com/index.php/X830.